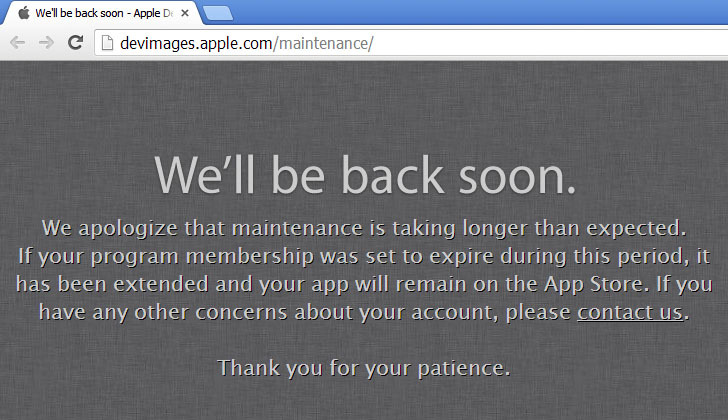 It’s been over a day now since Apple’s online Dev Center went offline, and latest message can be seen in the screenshot, which explains that the current maintenance has took a lot longer than they expected. "We apologize that maintenance is taking longer than expected. If your program membership was set to expire during this period, it has been extended and your app will remain on the App Store. If you have any other concerns about your account, please contact us. Thank you for your patience." message said. Since that time, developers have been unable to access the site and cannot visit the forums or download Mac or iOS SDKs, the iOS 7 beta, or the Mavericks beta. It was first seemed like Apple having some backend issues but according to tweets from many developers, they have received a message from Apple that an attempt was made to reset their user ID’s password. 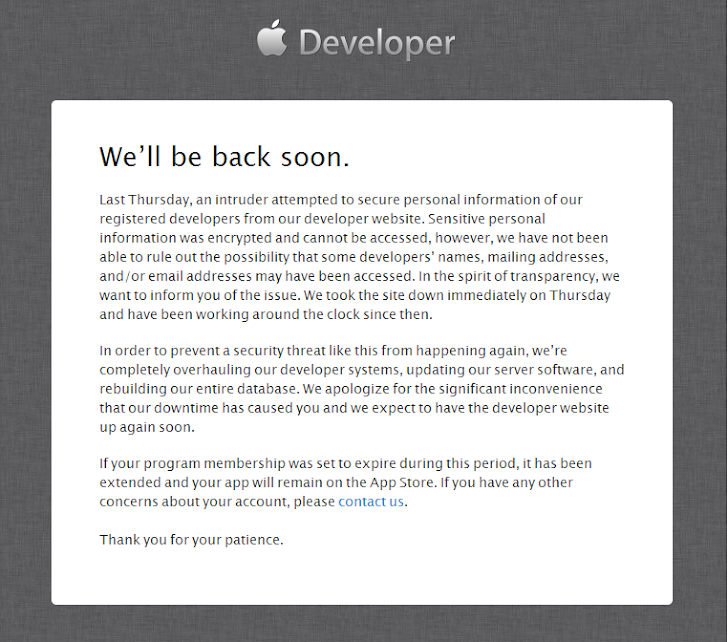 Such notices pointing that Apple’s Developer Center website may have been compromised. But if it is a security issue, there still remain unanswered questions over what happened. This is not a problem if you have no need to visit your Apple developer account, but for those of you that want to add another iPhone or iOS device to your account, it is a real problem. Possibly that iOS 7 beta 4 download will arrive right around the time of the Dev Center return. Apple has published a statement claiming that an intruder attempted to steal the details of registered developers from the company’s developer website. A UK based security researcher, Ibrahim Balic claims that he reported 13 Vulnerabilities in Apple system, highlighting a hole that could left data from the Developer Center exposed. For proof of concept, he demonstrated the hack on his own 73 employees while reporting to Apple security team. Though he admits that he was able to hack more than 100,000 users, but he did not hack the system for malicious purposes. Security researcher is not happy with Apple's Statement, that cited an attempted security breach as the reason for the developer site outage.